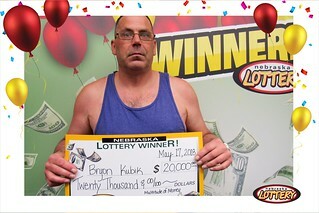 Bryon Kubik of Omaha won $20,000 playing the Multitude of Money Scratch ticket from the Nebraska Lottery. Kubik bought the winning ticket at Bucky’s #12 at 10202 Maple Street in Omaha, where he said he always buys his tickets. When he claimed his prize, Kubik told lottery officials that he was surprised he’d won and had to check the ticket multiple times. Kubik said he’s planning to pay some bills and go on vacation with his son. As a $20 Scratch game, Multitude of Money offers players a chance to win prizes from $20 to $20,000. The chances of winning $20,000 are one in 16,800, while the odds of winning any prize are one in 2.60.